1. Preheat the oven to 200ºC, gas mark 6. Peel the prawns, put into a bowl and set aside. Put the shells onto a roasting tray, toss with the oil and roast for 25-30 minutes. Leave to cool slightly. 2. Set a frying pan over a medium heat, add the spices and toast for 2 minutes until fragrant. Strain the prawn oil into the pan, stir to combine then add the garlic and ginger and fry for 3 minutes until soft. Tip the mixture into a large bowl, leave to cool slightly then stir in the yogurt. Season, then add the prawns. Toss to coat then cover and place in the fridge for 3 hours, or overnight if possible. 3. To make the salsa, preheat the oven to 60ºC, or the lowest setting on a gas oven. Cut the tomatoes into quarters and place on a tray. Roast for 4 hours. Remove the tomatoes from the oven and allow to cool. Cut the tomatoes into small cubes and combine with the red onions, chillies and olive oil. Season and sprinkle with the parsley. 4. To make the raita, mix the cucumber with the salt in a bowl and allow to stand for 1 hour. Squeeze most of the water out of the cucumber using a clean kitchen towel, then mix in a bowl with the yogurt and chopped mint. Season with freshly ground black pepper. 5. Preheat the barbecue. Remove the prawns from the yogurt marinade and place on the grill. Cook on all sides until fully cooked through. 6. Place the flat breads on the barbecue for a couple of minutes to toast. 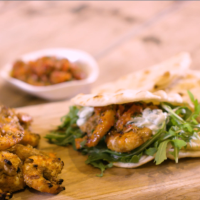 Spread some of the raita on each flatbread, add the prawns and top with a little salsa and a handful of rocket.